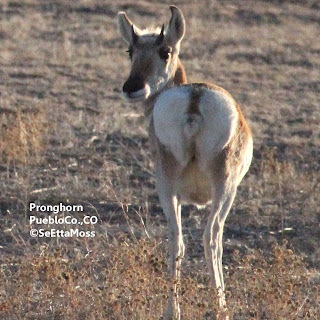 Boy, I've been distracted by a problem with not being able to access a number of pics I took in So Texas-now recovered I can get back to posting starting with these pronghorn then later I will post some of those So Texas pics. I spotted these beautiful pronghorn as the leaders began crossing a state highway in front of me. I pulled over immediately as there were no other vehicles around and I wanted the herd to quickly get across before vehicles that usually travel well over the 65 mph speed limit came and put them at risk. This strategy worked but I had not realized just how many pronghorn were in the herd--right around 30 animals, which is one of the largest herds I have seen in western Pueblo County in recent memory.